Concerns are being raised that stocks of a wild fish are being put at risk to protect Scotland's salmon farming industry. There has been a sharp rise in the use of so-called "cleaner fish" which push down the amount salmon producers have to spend on medicinal treatment. The fish - mostly wrasse - are housed in salmon cages to attack and eat parasitic sea lice. The industry insists it is now getting a grip on the sea lice problem. But environmental groups fear a lack of regulatory safeguards to protect the wild wrasse could lead to them being over-fished. Figures from the Scottish Salmon Producers' Organisation (SSPO) show that in 2016-17, £14m was spent on "biological" treatments for salmon, mainly through cleaner fish. The previous year the figure was £5.2m. In contrast, the spend on controversial "medicinal" treatments fell from £18.5m in 2015-16 to £13.8m last year. The overall spend on "fish health management" almost doubled from £26m to £49.4m. Nick Underdown, from Open Seas, told BBC Scotland: "Wrasse is an incredibly slow-growing species that's slow to reproduce and recovers very slowly if it's over exploited. "What we're seeing here is an unregulated fishery, poorly managed, that's being bankrolled by the salmon farming industry. "It is perverse for the salmon farming industry to protect its own stock and exploit a wild fishery." Efforts are under way for salmon farms to become fully reliant on farm-sourced wrasse, but because they are slow growing it is likely to take three years to meet demand. BBC Scotland understands that about three million wrasse are needed to support the 60 million salmon produced in Scotland, but only about 600,000 come from farms. The rest are caught in creels and transported to fish farms. Scott Landsburgh, chief executive of the SSPO said: "We are taking steps to ensure [overfishing] won't be an issue. That's why we are introducing hatcheries to breed our own cleaner fish and a huge investment is going into that just now. 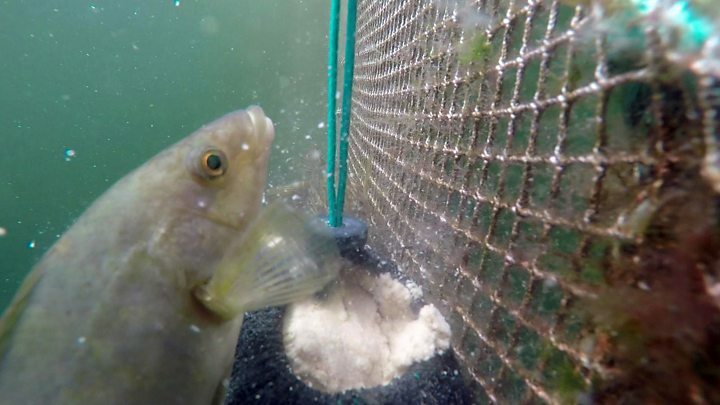 "We're introducing two new hatcheries in the next 12 months and we expect, in about three to four years, that we will not require any wild caught wrasse. "For the time being, yes we are taking some but we are very considerate about it and we are not taking any juvenile fish and are not taking any brood stock. So it's a very controlled take of the fish from the fishery." Open Seas has identified regulatory "loopholes" in the management of wild wrasse stocks which it wants to be closed. The group said there had been no stock assessments for wrasse and there were no limits on how much could be fished. A spokeswoman for the Scottish government said: "Scotland has a legislative and regulatory framework which balances growing aquaculture sustainably and protecting biodiversity and the environment on which aquaculture and wild fisheries depend. "We are currently in the process of developing the framework for a viable sustainability project and anticipate we will be in a position to progress soon." The industry has been relatively slow on the take-up of cleaner fish which are expensive and complicated to keep. It requires fish farmers to maintain stocks of two different types of fish in the same cage rather than just one. But Ralph Bickerdike, head of fish health at Scottish Sea Farms, describes the use of cleaner fish as "transformational". He said: "We are now seeing the fruits of the investment that has taken place over the last few years. "At the end of 2016 we had the lowest lice levels recorded for over three years which is a tremendous achievement and we look forward to that continuing."